Well this is not the cliched title of a wedding invitation but the narration of events that led to this wedding! For, Sandesh is a Pambada, a caste of dalits who are untouchables except when they get possessed by spirits- sorry not of those of the volatile kind but the local ones called as Bhoothas for which rituals called as Bhootha Kolas are performed and when they are done it is the members of this caste who dress themselves as those and perform the associated rituals! Any way the moment this costume is removed they become untouchables. Deepti belongs to a caste called as Kottaris and is studying for her masters in commerce while working at a mall. We have performed many intercaste, interreligious marriages but the maximum opposition has been when one of the couples is a dalit! As to be expected Deepti’s family was very much opposed this match and three days ago she fled home and started staying as a paying guest. Today it was a tearful shivering young woman who had come to meet me, worried about her fate and that of her beloved. That was because her family had arranged a match for her from her own caste, a young man who was a relative of the head of a most feared moral police of the Hindutwa right wing! She was scared that his goons were searching for her. In fact, all the documents needed for her marriage were kept at the place where she used to work and she was scared by the former colleagues who told her that a close watch was being kept on her locker by the minions of this man. She had come to us for help with a middle aged lady whom we assumed was her relative- but it was not! She was Sandesh's mother who had come with her out of love for her will be daughter in law. By that time a number of progressive organisations had been intimated and also some very progressive minded journalists. While we tried to get her documents from the place where she used to work, some goons from there tried to follow her and then it was a ride straight to the office of the Commissioner of Police, Sri Seemanth Singh who had instructed his office to give all help for the couple. By the time we reached the office, only Deepti’s brothers were there and they informed the police that they had absolutely no objection to her marrying any one of her choice. So, in the evening one progressive minded priest Jayaram Bhat performed their marriage in the presence of journalists and progressive minded organisations like DYFI, Samudaya, AIDWA, Insurance employees union and the Dakshina Kannada Rationalist Association! For the last named, though religious marriages are not their cup of tea, under some circumstances, particularly when registration has to be done immediately this sort of ritual becomes necessary. 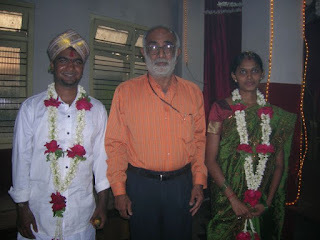 In a state like Karnataka where self respect marriages are not recognised as common law marriages for registration purposes some sort of a formal drama becomes necessary for registration purposes and we are very happy that Sri Jayaram Bhat has been co-operating with us for the past two decades when it becomes a need. Dear Narendra Nayak,you have done an exelent job.Now you are very rich in the field of rationalism and doing good to society.Iam always with you.With best wishes.Yours,Dr.G.Bhaskara Maiya. Thanks old friend. We have been together in the movement since 35 years!